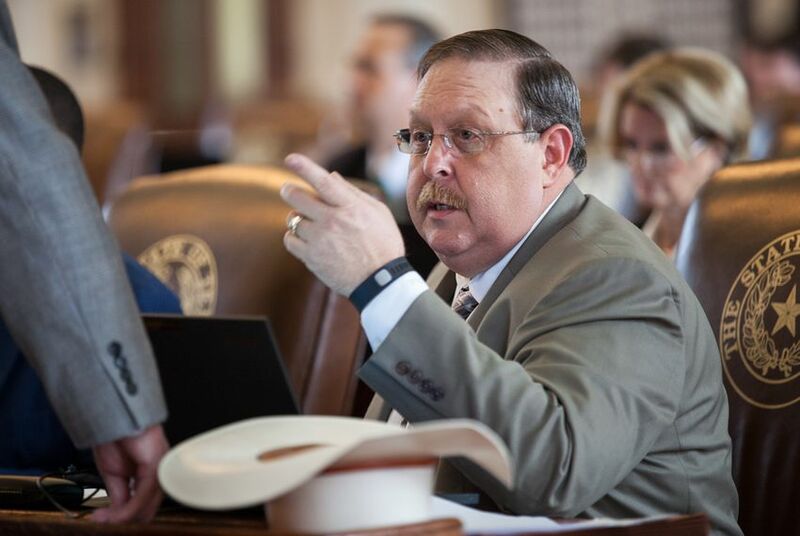 State Rep. Cecil Bell is a member of a committee that oversees utility districts in Texas. Many of those districts give his construction companies big contracts, while some of their lawyers contribute to his campaign. Editor's note: This is the second of two stories on potential conflicts of interest involving lawmakers with business ties to public entities. You can read the first story here. When it comes to lawmakers who have signed big contracts with municipal utility districts — political subdivisions often referred to as MUDs — state Rep. Cecil Bell is in a class of his own. Bell’s pro-developer attitude and his seat this year on the MUD-governing House Special Districts Committee make him a go-to lawmaker at the Capitol for builders who need help from the government. As a state representative, the Republican from Magnolia has sponsored a number of bills to create or benefit MUDs in recent years. As a general contractor — he owns several companies that build water and wastewater treatment facilities and install underground utilities — he’s been awarded numerous contracts from MUDs, including one that he helped create. The Texas Tribune analyzed the Texas Ethics Commission’s “Form 1295” database — which reveals business contracts between state politicians and political subdivisions, including MUDs — and found that since Texas began requiring those disclosures in January 2016, Bell’s businesses have signed 33 contracts with 18 different local utility districts, mostly in the Houston area. One of these entities, the Woodridge MUD, overlaps with Bell’s district. Some lawyers for those MUDs have both given Bell campaign donations and testified in favor of MUD-related bills he’s sponsored. Bell estimated that the storm maintenance and monitoring contracts he signed with MUDs are worth between $15,000 and $30,000, and valued his contracts to build water plants for MUDs at $1 million to $2 million. He told the Tribune that the contracts were all awarded through competitive bidding and said his firms have no “special privilege” when MUDs choose contractors. In 2015, Bell voted to give road-building powers to the Pine Forest MUD. The next year Pine Forest awarded Bell’s firm a contract that he estimated at $30,000, according to a Houston Chronicle report. In the past three regular legislative sessions, Bell authored 11 successful bills that created or expanded the powers of MUDs that were represented by attorneys who donated to his campaigns — in some cases the attorneys lobbied for those same bills in front of legislative committees, including the Special Districts Committee that Bell sits on. Bell did not declare a conflict of interest or recuse himself during any of the proceedings related to those bills. But under Texas ethics laws, he didn’t have to. Legislators generally interpret the state’s ethics laws to say they only have to disclose potential conflicts of interest if a bill benefits them individually — but not when it simply benefits their wider profession. For example, Bell could argue that his MUD bills benefit the entire Texas contracting industry, and the MUDs he created are free to hire any contractor — including his own. Bell told the Tribune that recusal was unnecessary because he has “zero control” over whether a MUD gives him a contract. “Just because you can get away with it doesn’t mean you should,” Birch said. Mark Jones, professor of political science at Rice University, said conduct like Bell’s is “definitely crossing the line ethically” for lawmakers. “If you are a resident in these MUDs, you are effectively getting shortchanged because these MUDs are getting more powers” through Bell’s bills to incur debt that will likely be repaid by MUD residents through higher taxes. Typically located in fast-growing suburban or exurban areas, MUDs are a favorite tool of developers, who use them to defray the costs of building and providing basic services like water and roads on unincorporated land outside of city limits. Bell said MUDs deliver “the infrastructure necessary for the Texas Miracle.” He said that MUDs are a “responsible way” to finance that infrastructure because they limit the tax burden to MUD residents, while the benefits of the new construction benefit the wider community. But they have been criticized by some residents who say developer controlled MUD boards can unilaterally raise local property taxes without the same accountability to citizens as city governments. MUD boards can be elected before the land is developed, which in some cases means they are chosen by as few as two people who live on the empty blocks that developers want to build on. And, unlike cities, MUD boards are not subject to caps on their debt under state law. Bell says that people who choose to live in MUDs accept the possibility that their taxes could rise, the same as if they lived in a city. MUDs have many of the same powers as cities: They can acquire land through eminent domain, issue tax-free bonds and levy taxes on residents within their boundaries. But if developers want to create “special law” MUDs — which have different powers than normal MUDs, such as additional money-raising powers and the ability to build roads — they need the Legislature to pass a bill. Developers typically hire lawyers who specialize in this area to help establish, empower and issue bonds for their MUDs. And those lawyers often seek out Bell for help. Bell said these attorneys are the “interface” between MUDs and the Legislature and have asked him to carry MUD-related bills. For example, Houston-based Allen Boone Humphries Robinson represents six MUDs that have collectively awarded Bell’s firms 11 contracts for water, sewage, drainage and gardening services since Form 1295 filings began in January 2016. The law firm has given Bell nearly $10,000 in campaign contributions since 2012, according to campaign finance records at the Texas Ethics Commission. Bell authored 12 bills in 2013 and 2015 to create or expand the powers of MUDs that were clients of Allen Boone Humphries Robinson. The firm’s attorneys — usually Trey Lary, a partner in the firm — testified or registered to testify in favor of at least nine of these bills in front of House or Senate committees. Lary told the Tribune that his firm regularly helps lawmakers like Bell with legislation. He said the firm doesn’t think Bell has a conflict of interest. The firm donates to Bell because he has “a vision of the continued growth and development of Texas.” He noted that MUDs have to follow state laws when they award contracts to firms like Bell’s. State law says MUDs must publicly advertise contracts worth more than $75,000 and open them to competitive bidding. State rules say that for contracts between $25,000 and $75,000, MUDs must solicit three competitive bids but don’t have to advertise. For contracts worth less than $25,000 there are no requirements for advertising or competitive bidding. Bell said he was not aware of any contracts his firms won without competitive bidding, but he said it was possible. Bell also has received $5,000 in campaign contributions since 2012 from Schwartz, Page & Harding, a Houston law firm that represents two MUDs that have awarded Bell’s companies three contracts to construct wastewater treatment facilities. Earlier this year, Bell authored three bills creating or expanding the powers of MUDs represented by the firm, and one of its partners, Howard Cohen, registered his support for all three bills when they were debated in Bell’s Special Purpose Districts Committee. He said each of the bills Bell authored for the firm’s clients were to create or empower MUDs within Bell’s district and that it’s common practice for lawyers to “work and communicate” with legislators about MUDs within their districts. Bell said that with his long experience in the construction industry, “it would be more surprising if I was unable to pick up” that kind of work from MUDs. "You still have to be the low bidder," he said. Are lawmakers' business ties with public entities a conflict of interest?